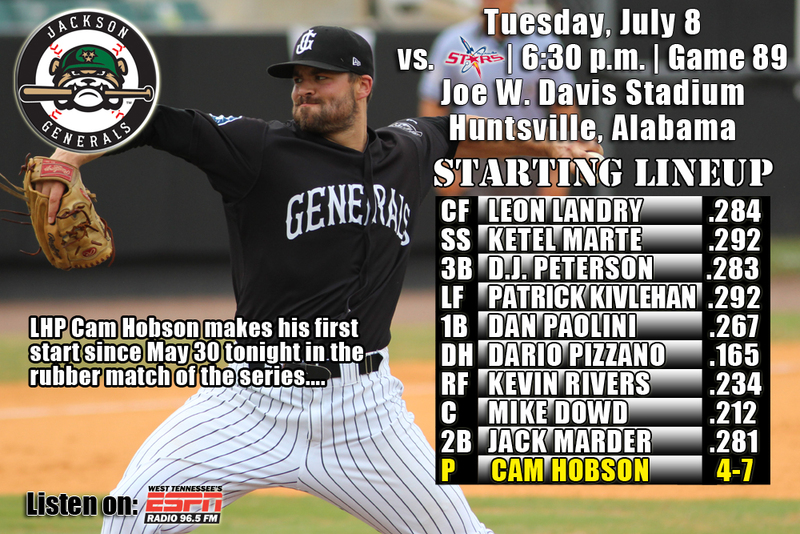 • The Generals open a 5-game homestand tonight against the Birmingham Barons in Jackson…are coming off a series win at Huntsville (3-2) and have won 3 of 4…also are 3-2 against Birmingham this season and will play the Barons 10 times in the final 50 games. • SS Ketel Marte recorded 3 hits and 3B D.J. Peterson recorded his 3rd home run as Jackson defeated Huntsville 7-4 in a 6 inning rain-shortened game on Tuesday night. • Marte (3×4, R, 3B, 3 RBI) and LF Patrick Kivlehan (2×3, R, RBI) each recorded multi-hit efforts as part of an 11-hit attack by the Generals. Peterson (1×4, R, HR, RBI) hit his 3rd home run in his last 4 games with the Generals. He currently leads all Mariners farmhands with 21 home runs this season (18 with High Desert). • Starter Cam Hobson (5.0,6,4,4,0,1,HR) recorded his 5th win of the season, allowing 4 runs on 6 hits in 5.0 innings. RH David Colvin (0.1,0,0,0,0,0) retired the only batters faced in the 6th inning before the game was called to earn his 3rd save. • The Generals batted .321 (45×140) over their last 4 games in Huntsville, winning 3 of those, scoring 24 runs on 45 hits with 6 doubles, 3 triples and 7 home runs. • Jackson now ranks 5th in the league doubles (159), 2nd in triples (30), 4th in slugging (.384) and T-3rd in batting (.261) on the season. • 3B D.J. Peterson homered on Saturday, Sunday and Tuesday in Huntsville and hit safely in 12 of 13 games with Jackson, batting .283 (15×53) with 5 runs scored, 2 doubles, 3 home runs, 7 RBI and 3 walks. • This week’s transactions – On Monday LHP Nick Hill was placed on the DL and RHP Matt Brazis (BRAY-zus) was added from A+ High Desert…On Tuesday C John Hicks was promoted to AAA Tacoma and C Steve Baron was added from A+ High Desert. • Hot Hitting July – After batting .294 as a team in June, the Generals are currently batting .271, which ranks 3rd in the league. The 8 home runs also ranks 3rd in the league. • INF Dan Paolini has hit safely in all 7 games he has appeared in July, batting .458 (11×24) with 5 runs scored, 4 doubles, 1 home run, 5 RBI and 2 walks. • OF Leon Landry has hit safely in 11 of his last 12 games, batting .321 (17×53) with 8 runs scored, 3 doubles, 1 triple, 2 RBI and 5 stolen bases. Since June 7, Landry has hit safely in 23 of his last 26 games with 13 multi-hit efforts, batting .359 (37×103) with 18 runs scored, 6 doubles, 3 triples, 5 RBI, 3 walks and 10 stolen bases. During this 26 game stretch he has raised his season average from .236 to .284. • OF Julio Morban has hit safely in 11 of his last 14 games with 7 multi-hit efforts, batting .340 (18×53) with 6 runs scored, 2 doubles, 1 triple, 1 home run, 4 RBI and 5 walks. • The Generals wrap up a 5-game road series Tuesday night with the rubber match of the series against Huntsville…Jackson is 3-4 in rubber matches…coming off a 2-8 homestand against Tennessee (1-4) and Mobile (1-4)…are 6-8 against Huntsville this season and 3-6 at Joe Davis Stadium. • LF Jack Marder recorded 4 hits and C John Hicks hit his 3rd home run of the season, but it wasn’t enough as Jackson lost to Huntsville 6-2 on Monday night. • Marder (4×4) and Hicks (2×3, R, HR, 2 RBI) combined for 6 hits, while 3B D.J. Peterson (1×3), 1B Patrick Kivlehan (1×4), DH Julio Morban (1×4) and RF Dan Paolini (1×4, R) each recorded 1 of the team’s 10 hits. • Starter Tyler Pike (2.1,4,5,4,4,3) recorded his first AA loss, allowing 5 runs (4 ER) on 4 hits in 2.1 innings. RH Matt Brazis (3.2,1,1,1,0,3,HR) allowed a solo home run in the bottom of the 6th inning, while RH Moises Hernandez (2.0,0,0,0,0,2) struck out 2 in 2.0 shutout innings. • The Generals have batted .306 (34×111) over their last 3 games scoring 17 runs on 34 hits with 5 home runs. • Former General Seager headed to ASG – 2011 General 3B Kyle Seager, 26, will make his Midsummer Classic debut in his 4th Major League season. On the year, the University of North Carolina product is batting .274 with 13 home runs, 59 RBI, 21 doubles and a .483 slugging percentage. He replaces Edwin Encarnacion of the Toronto Blue Jays on the A.L.’s active roster for the 85th All-Star Game.• Generals, Stars meet at “The Joe” again – In the final season of baseball in Huntsville, the Stars and Generals meet 25 times this season with 15 meetings coming at Joe Davis Stadium (3-6).• INF Dan Paolini has hit safely in all 6 games he has appeared in July, batting .476 (10×21) with 5 runs scored, 4 doubles, 1 home run, 4 RBI and 2 walks.• Since May 22, RH Matt Anderson is 3-1 with a 2.23 ERA (12 ER, 48.1 IP) in his last 8 starts. During this stretch he has struck out 38.• OF Leon Landry has hit safely in 10 of his last 11 games, batting .327 (16×49) with 7 runs scored, 3 doubles, 1 triple, 2 RBI and 5 stolen bases. Since June 7, Landry has hit safely in 22 of his last 25 games with 13 multi-hit efforts, batting .364 (36×99) with 17 runs scored, 6 doubles, 3 triples, 5 RBI, 3 walks and 10 stolen bases. During this 24 game stretch he has raised his season average from .236 to .284.• OF Julio Morban has hit safely in 11 of his last 14 games with 7 multi-hit efforts, batting .340 (18×53) with 6 runs scored, 2 doubles, 1 triple, 1 home run, 4 RBI and 5 walks.• Since June 7, C John Hicks has reached base safely in 14 of 16 games, batting .364 (20×55) with 10 runs scored, 1 home run, 4 doubles, 1 triple, 8 RBI, 7 walks and 3 stolen bases. • 3B D.J. Peterson has hit safely in 11 of 12 games, including multi-hit performances in 3 of last 4 games. He has a .286 average with 2 homers, 2 doubles and 6 RBIs for Jackson. He had only 2 extra-base hits and 1 RBI through his first 9 games entering the current road trip, now going 7-for-17 against the the Stars. • RH Richard Vargas has appeared in 6 games since the All-Star going 1-0, and is 3-for-3 in save opperunities, not allowing a run in 8 IP. Vargas has walked 3 and struck out 10, while giving up just 2 hits holding opponents to a .074 AVG (2×27). This is after going 0-1, with a 6.12 ERA in the first half going 2-for-4 in save oppertunites walking 24 and striking out 30 in 32.1 IP. • The Generals continue a 5-game road series Monday night with game 4 against the Huntsville Stars…coming off a 2-8 homestand against Tennessee (1-4) and Mobile (1-4)…are 5-7 against Huntsville this season and 3-5 at Joe Davis Stadium. • 3B D.J. Peterson and DH Dan Paolini hit home runs and combined to drive in 6 runs for the Generals as Jackson defeated Huntsville 8-5 on Sunday. • Paolini (3×4, R, 2B, HR, 3 RBI, BB) led the team with 3 hits, including hitting his 5th home run with a 1-out, 2-run blast in the 2nd inning. Peterson (2×5, 2 R, HR, 3 RBI) hit his 2nd home run in consecutive games with a solo shot with 2 outs in the 9th inning. He currently leads all Mariners farmhands with 20 home runs (2 with Jackson). • Starter Victor Sanchez (7.0,4,2,2,3,4) recorded his 4th win, allowing only 2 runs on 4 hits over 7.0 innings. LH Kyle Hunter (1.0,1,0,0,0,0) tossed a scoreless 8th inning, while RH David Colvin (1.0,2,3,2,1,1) allowed 3 runs (2 ER) in the 9th inning before closing out the game. • Today’s starter LH Tyler Pike is 1-0 with a 1.46 ERA (2 ER, 12.1 IP) in 3 AA starts. He has limited opponents to a .184 (7×38) average, while walking 11 and striking out 7. • Generals, Stars meet at “The Joe” again – In the final season of baseball in Huntsville, the Stars and Generals meet 25 times this season with 15 meetings coming at Joe Davis Stadium (3-5). • INF Dan Paolini has hit safely in all 5 games he has appeared in July, batting .529 (9×17) with 4 runs scored, 4 doubles, 1 home run, 4 RBI and 2 walks. • Since May 22, RH Matt Anderson is 3-1 with a 2.23 ERA (12 ER, 48.1 IP) in his last 8 starts. During this stretch he has struck out 38. • OF Leon Landry has hit safely in 10 of his last 11 games, batting .327 (16×49) with 7 runs scored, 3 doubles, 1 triple, 2 RBI and 5 stolen bases. Since June 7, Landry has hit safely in 22 of his last 25 games with 13 multi-hit efforts, batting .364 (36×99) with 17 runs scored, 6 doubles, 3 triples, 5 RBI, 3 walks and 10 stolen bases. During this 24 game stretch he has raised his season average from .236 to .284. • OF Julio Morban has hit safely in 10 of his last 13 games with 7 multi-hit efforts, batting .347 (17×49) with 6 runs scored, 2 doubles, 1 triple, 1 home run, 4 RBI and 5 walks. • Since June 7, C John Hicks has reached base safely in 13 of 15 games with hits 11 games, batting .346 (18×52) with 9 runs scored, 4 doubles, 1 triple, 6 RBI, 7 walks and 3 stolen bases. • 3B D.J. Peterson has hit safely in 10 of 11 games, including multi-hit performances in each of his past 3 games. He has a .283 average with 2 homers, 2 doubles and 6 RBIs for Jackson. He had only 2 extra-base hits and 1 RBI through his first 9 games entering the current road trip, now going 6-for-14 against the the Stars. • So far in the second half 11 of 18 games have been decided by 2-runs or less and 8 have been 1-run games including 7 of the last 10 games (2-5). • Jackson is 6-14 in 1-run games in 2014 and now 4-3 in extra inning games including winning the last two extra inning contests. • Last Tuesday, Peterson was named to the U.S. Team for the upcoming 2014 SiriusXM All-Star Futures Game. Peterson will be joined at the All-Star Futures Game by High Desert outfielder Gabby Guerrero, who will play on the World Team at the July 13 game at Target Field in Minneapolis as part of the All-Star Week festivities. 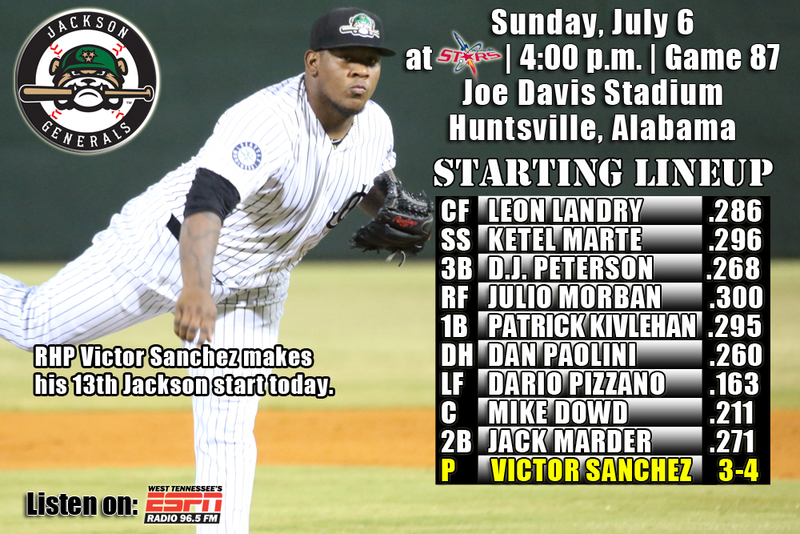 • The Generals continue a 5-game road series Sunday with game 3 against the Huntsville Stars…coming off a 2-8 homestand against Tennessee (1-4) and Mobile (1-4)…are 5-7 against Huntsville this season and 2-5 at Joe Davis Stadium. • RF Julio Morban hit a solo home run with 1 out in the top of the 10th inning as Jackson defeated Huntsville in extra-innings on Saturday night 7-6. • Morban (2×5, 2 R, HR, RBI), CF Leon Landry (2×5, R), 3B D.J. Peterson (2×5, R, HR, RBI), DH Dan Paolini (2×5, R, 2B), C John Hicks (2×4, R, BB, SB) and LF Dario Pizzano (2×4, R, BB) each recorded 2 of the Generals 13 hits. • Morban hit his 10th home run of the season, while Peterson hit his first AA home run (19th overall in 2014) with a solo blast with 1 out in the 5th inning. • Starter Stephen Landazuri (4.0,2,3,3,3,3) allowed 3 runs on 2 hits in 4.0 innings, but did not factor into the decision. RH Trevor Miller (2.1,5,3,3,2,2) allowed 3 runs over 2.1 innings, while RH Moises Hernandez (1.1,1,0,0,3,0), LH Kyle Hunter (1.1,0,0,0,0,2) and RH Richard Vargas (1.0,0,0,0,0,2) combined to hold the Stars scoreless over the final 3.2 innings in relief. Hunter earned his 2nd win after striking out 2 in 1.1 innings and Vargas picked his 5th save with a scoreless 10th inning. • So far in the second half 11 of 17 games have been decided by 2-runs or less and 8 have been 1-run games including 7 of the last 9 games (2-5). 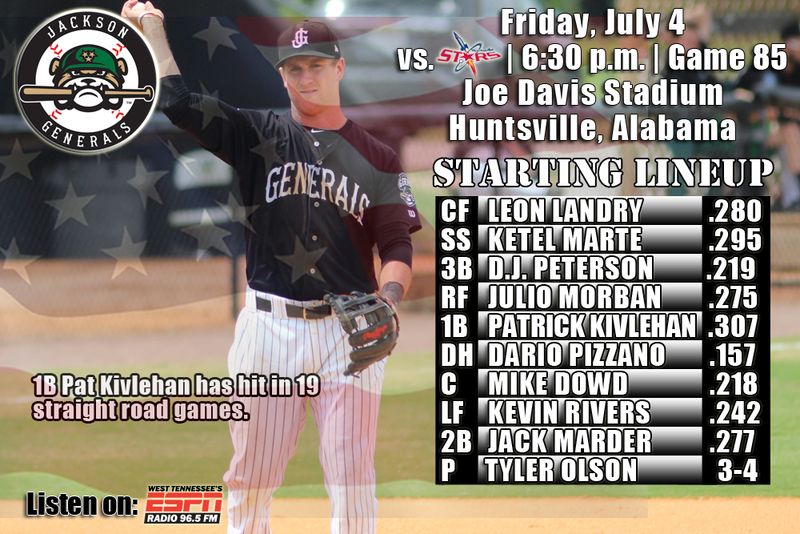 • Generals, Stars meet at “The Joe” again – In the final season of baseball in Huntsville, the Stars and Generals meet 25 times this season with 15 meetings coming at Joe Davis Stadium (2-5). • INF Dan Paolini has hit safely in all 4 games he has appeared in July, batting .462 (6×13) with 3 runs scored, 1 RBI and 1 walk. • LH Tyler6 Pike is 1-0 with a 1.46 ERA (2 ER, 12.1 IP) in 3 AA starts. He has limited opponents to a .184 (7×38) average, while walking 11 and striking out 7. • OF Leon Landry has hit safely in 9 of his last 10 games, batting .341 (15×44) with 6 runs scored, 2 doubles, 1 triple, 2 RBI and 5 stolen bases. Since June 7, Landry has hit safely in 21 of his last 24 games with 13 multi-hit efforts, batting .372 (35×94) with 16 runs scored, 5 doubles, 3 triples, 5 RBI, 3 walks and 10 stolen bases. During this 24 game stretch he has raised his season average from .236 to .286. • OF Julio Morban has hit safely in 10 of his last 12 games with 7 multi-hit efforts, batting .348 (16×36) with 6 runs scored, 2 doubles, 1 triple, 1 home run, 4 RBI and 3 walks. • 3B D.J. Peterson and RF Julio Morban each homered for the first time for Jackson on Saturday. The homer though was Peterson’s 19th this season combined between High Desert (A+) and Jackson. • Peterson has hit in 9 of 10 games since being promoted to Jackson on June 24, batting .268 (11×41) 1 home run, 2 doubles and 3 RBI. • Morban has 7 muli-hit games out of 19 played in since joining Jackson on June 19, batting .300 (18×60) with 1 home run, 3 doubles, 1 triple and 5 RBI. 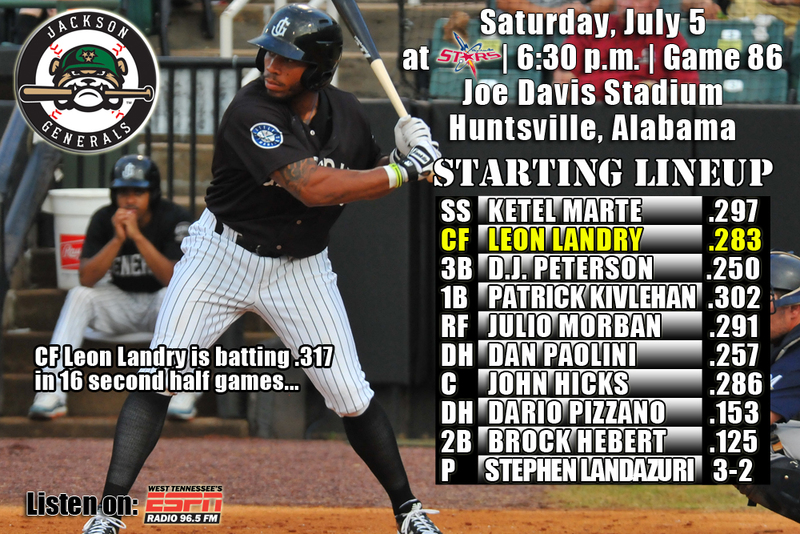 • The Generals continue a 5-game road series tonight with game 2 against the Huntsville Stars…coming off a 2-8 homestand against Tennessee (1-4) and Mobile (1-4)…are 4-7 against Huntsville this season and 1-5 at Joe Davis Stadium. • The Generlas held a 2-0 lead and a 3-2 lead, but wasn’t enough as Jackson lost to Huntsville 4-3 on Friday night. • CF Leon Landry (2×4, 2 R, SB), SS Ketel Marte (2×4, R), 3B D.J. Peterson (2×4, RBI) and RF Julio Morbon (2×4, 2 RBI), the Generals 1-4 batters in the lineup, combined to record all 8 of the team’s hits, runs scored and RBI. • Starter Tyler Olson (5.0,8,3,3,0,6) allowed 3 runs on 8 hits in 5.0 innings, but did not factor into the decision. LH Cam Hobson (2.0,2,1,0,2,1) recorded the loss after allowing 2 runs (1 ER) on 2 hits in 2.0 innings in relief. RH David Colvin (1.0,0,0,0,0,1) tossed a 1-2-3 9th inning to close out the game. • The Generals have lost 9 of 11 games and 6 of those have been 1-run games ( 6 of last 8 and 5 have been losses). Jackson has held leads in 6 of the 9 losses and this season have led in 22 of the 50 losses. • D.J. Peterson, the No. 2 prospect for the Mariners, according to Baseball America and was Seattle’s 12th overall selection in the 2013 draft out of New Mexico. He has currently hit safely in 8 of 9 games he has appeared, batting .250 (9×36) with 1 run scored, 2 doubles, 2 RBI and 2 walks. 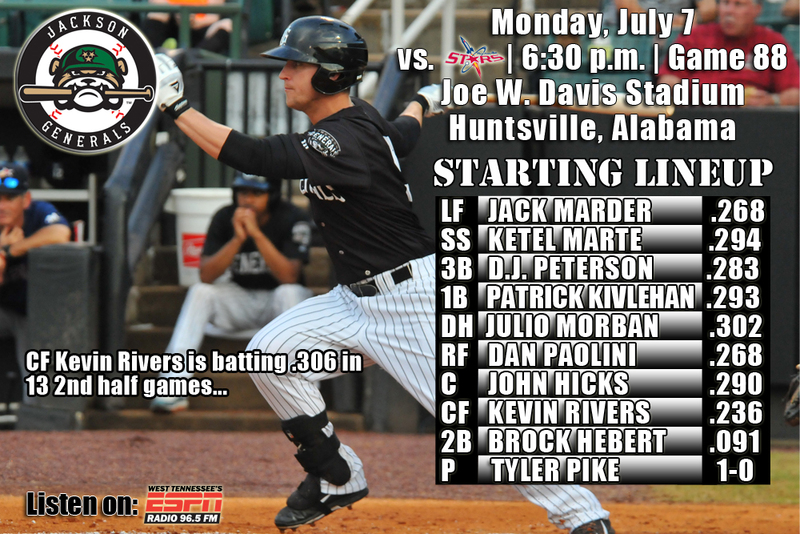 • The Generals begin a 5-game road series tonight with game one against the Huntsville Stars…coming off a 2-8 homestand against Tennessee (1-4) and Mobile (1-4)…are 4-6 against Huntsville this season and 1-4 at Joe Davis Stadium. • Generals, Stars meet at “The Joe” again – In the final season of baseball in Huntsville, the Stars and Generals meet 25 times this season with 15 meetings coming at Joe Davis Stadium (1-4). • LH Tyler Pike is 1-0 with a 1.46 ERA (2 ER, 12.1 IP) in 3 AA starts. He has limited opponents to a .184 (7×38) average, while walking 11 and striking out 7. • OF Leon Landry went 0-for-4 last night vs. Mobile snapping his hitting streak at 7 games. During the streak he hit .335 (11×35) with 3 runs scored, 1 triple, 2 RBI and 4 stolen bases. He has also hit safely in 19 of his last 22 games with 11 multi-hit efforts, batting .365 (31×85) with 13 runs scored, 5 doubles, 3 triples, 5 RBI, 3 walks and 9 stolen bases. • The Generlas scored 3 runs in the bottom of the 8th inning, including a solo home run by 3B Patrick Kivlehan, but the rally fell short as Jackson lost to Mobile 4-3 on Thursday night. Kivlehan (1×3, R, HR, RBI), 1B Dan Paolini (1×3, R), C John Hicks (1×3, R, RBI) and 2B Brock Hebert (1×3) each recorded 1 of the team’s 4 hits. Starter Matt Anderson (8.0,8,3,3,1,9,HR) allowed 3 runs on 8 hits, while setting career highs in strikeouts and innings pitched, but did not factor into the decision. RH Stephen Shackleford (1.0,2,1,0,1,3) recorded the loss after allowing an unearned run in the top of the 9th inning. • Jackson finished the 10-game homestand 2-8, dropping 4 of 5 from both Tennessee and Mobile. • Jackson batted .247 and posted a 3.66 ERA with 76 strikeouts in 86.1 IP. The Generals were outscored 41-26. • Kevin Rivers led the team offensively batting .368 (7×19) with 2 runs scored and a home run. • INF Patrick Kivlehan has hit safely in 19 straight road games, batting .380 (27×71) with 6 doubles, 1 triple, 3 home runs and 20 RBI. • They are 17-23 on the road this season batting .253 with a 3.63 ERA. • D.J. Peterson, the No. 2 prospect for the Mariners, according to Baseball America and was Seattle’s 12th overall selection in the 2013 draft out of New Mexico. He has hit safely in 7 of 8 games he has appeared, batting .219 (7×32) with 1 run scored, 2 doubles, 1 RBI and 2 walks. 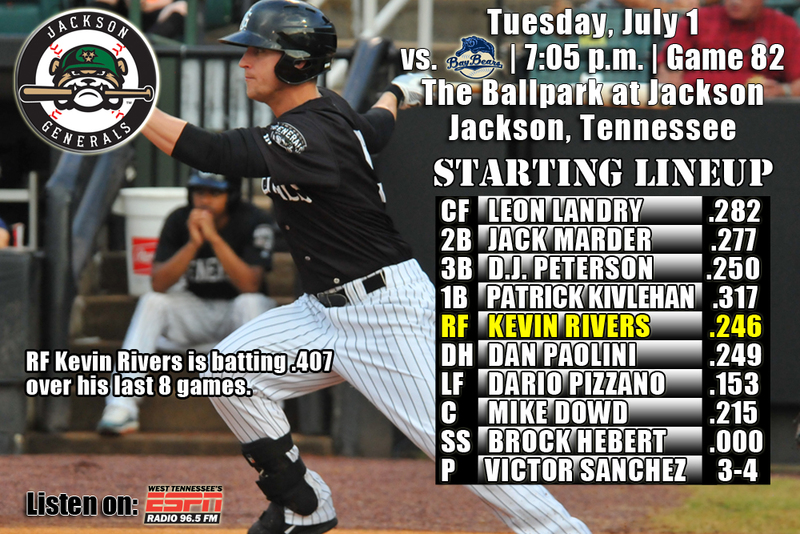 • Tonight the Generals wrap up their 10-game homestand (2-7) with game five of the series against Mobile (1-3). 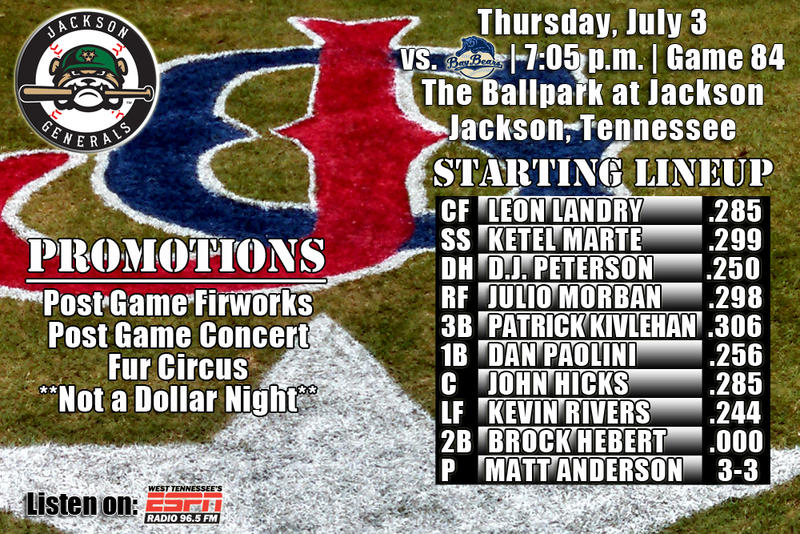 The Generals went 1-4 against Tennessee in the first leg of the homestand…are 4-10 against Mobile this season. 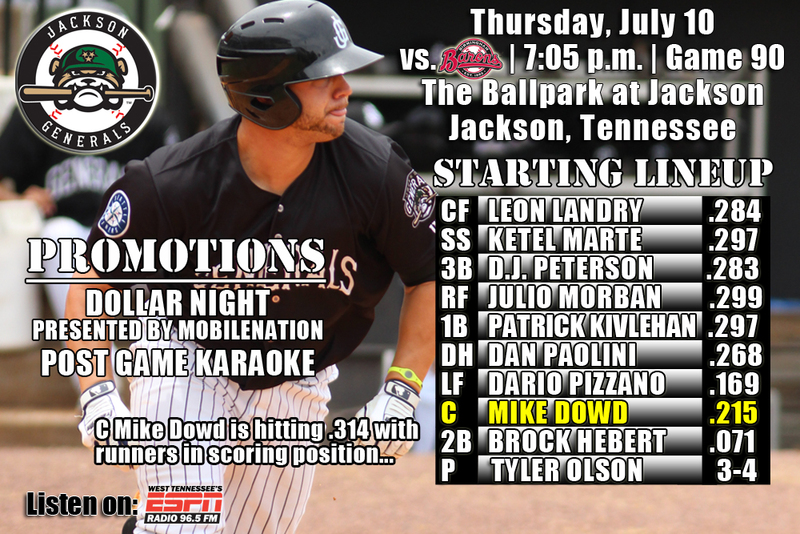 • In the suspended game LF Dario Pizzano drove in the Generals only run in the bottom of the 6th inning to tie the game at 1-1, but the pitching staff allowed 5 runs over the 8th and 9th innings as Jackson lost to Mobile 6-1 in game 1 on Tuesday night. • CF Leon Landry (2×5) and DH Dan Paolini (2×3, R, BB) each recorded 2 of the team’s 8 hits, while Pizzano (1×3, 2B, RBI, BB) recorded the Generals only RBI. • Starter Victor Sanchez (4.0,3,0,0,1,2) allowed 3 hits and struck out 2, but didn’t factor into the decision. RH Trevor Mller (1.0,1,1,0,2,1), LH Kyle Hunter (2.2,4,2,2,2,1), LH Nick Hill (0.2,2,3,3,1,0,HR) and RH Moises Hernandez (0.2,0,0,0,0,1) combined to allow 6 runs (5 ER) over the final 5.0 innings. • In game 2, Starter Tyler Pike and reliever Richard Vargas combined on a 3-hit 7.0-inning shutout as Jackson defeated Mobile 3-0. Pike (5.1,3,0,0,3,4) earned his first AA win, allowing 3 hits and striking out 4 in 5.1 innings. Vargas (1.2,0,0,0,1,4) struck out 4 batters over the final 1.2 innings to pick up his 4th save of the season. • CF Leon Landry (1×3, R, 2B), SS Ketel Marte (1×3, 2 RBI), 3B D.J. Peterson (1×3) and Dan Paolini (1×2, 2B, RBI) each recorded 1 of the Generals 4 hits. • D.J. Peterson, the No. 2 prospect for the Mariners, according to Baseball America and was Seattle’s 12th overall selection in the 2013 draft out of New Mexico. He has hit safely in all 7 AA games he has appeared, batting .250 (7×28) with 1 run scored, 2 double, 1 RBI and 2 walks. • OF Leon Landry currently has a 7 game hit streak, batting .335 (11×35) with 3 runs scored, 1 triple, 2 RBI and 4 stolen bases. He has also hit safely in 19 of his last 21 games with 11 multi-hit efforts, batting .383 (31×81) with 13 runs scored, 5 doubles, 3 triples, 5 RBI, 3 walks and 9 stolen bases. • OF Julio Morban has hit safely in 7 of his last 9 games, batting .364 (12×33) with 4 runs scored, 2 doubles, 1 triple, 1 RBI and 3 walks. • RH Matt Anderson is 3-1 with a 2.01 ERA (9 ER, 40.1 IP) in his last 7 starts. • Erasmo Ramirez, James Paxton (DL) and Roenis Elias are in the starting rotation. Elias was a 2013 Southern League All-Star. • Dustin Ackley, Michael Saunders,, Kyle Seager, Brad Miller, James Jones, Stefen Romero and Mike Zunino are position players.